Because he treats cancer patients with radiation therapy, my father has worn a small, square badge on his person every day for the past—oh, I don’t know how many years. Thirty five, at least. The badge measures his exposure to radioactive energy. It consists of a piece of photographic film, a few filters, a flat plastic canister to hold it all together. I used to see it on him often, once. There was a time when I would spend afternoons in his office after school: happy there as I was nowhere else, drawing on smooth, beautiful pieces of printer paper as white as his lab coat and smelling that sharp hospital smell. In my memory, which I tug on like a fishing line until it surfaces—pop!—with what I am seeking—it is yellow, this dosimeter. It has his name on it. It crackles a little, as film does, if you are allowed to press gently down on it with your thumb. But it doesn’t look, to me, particularly impressive. I know it is important but I am not sure why. I know it is keeping him safe but I am not sure how. Should it turn dark, it will counsel danger. It is making something visible that does not want to be seen. My sister and brother-in-law sent me a book for my birthday this year that does the same thing. Radioactive is artist and writer Lauren Redniss’s attempt to translate two unseen forces—radiation and love—into visible form. What she has produced, in the name of this goal, is an object of great charm: a literate, supple biography of Marie Curie, illustrated with (intentionally) primitive drawings and collages composed of photographs, primary documents, and found artifacts. The words are set in an original typeface Redniss modeled after the title pages of old scientific manuscripts. Her pages are nothing if not a pleasure to turn—now dark and brooding, now bursting with lurid color, and filled with human figures stretching and deforming into strange proportions, as if made of melting wax. Too often, unfortunately, these transitions feel forced, not quite living up to the meanings they are presumably intended to carry. A page announcing the birth of Marie’s second daughter is immediately followed by a spread introducing Manhattan Project physicist Irving S. Lowen; the movement feels random. And when an odd little exposition of a radon health spa in Montana appears, complete with an interview with two true believers, the irony—though clear—trips awkwardly on the heels of the previous, haunting, page. Glowing an unearthly orange, it shows a ghostlike negative of Marie’s skeletal body: One assistant described Marie’s presence in the lab as nearly immaterial, “as if she could walk through walls.” Wraithlike, a humming in her ears, and her vision failing after four cataract surgeries, she felt her way among her instruments and through the rooms of her laboratory. At dawn on July 4, 1934, Marie Curie passed away. It is when Redniss works to make love visible on the page that Radioactive is at its most powerful. An enchanting early spread shows Marie’s first meeting with Pierre in the laboratory of Gabriel Lippman. The two are shyly separated, she on the edge of the recto and he the margin of the verso, their bodies tall and straight and parallel to each other. She looks over her shoulder, eyes so big with watching him that they are easily three times as large as her demure fingertips. He has been drawn with two overlapping countenances—two noses, two mouths, two mustaches, two sets of eyes—as if continually pulling his gaze toward her, then away—drawing motion out of a frozen page. 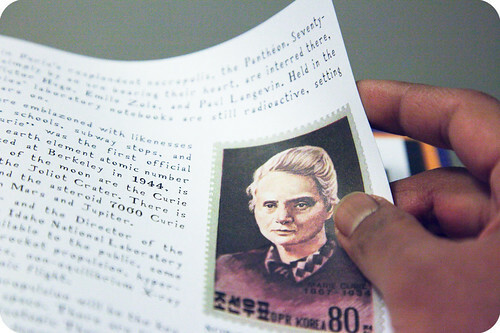 Love, like radiation, inflamed Marie Curie’s life. Both brought her the brightest satisfactions she would ever experience; both also aroused the most blistering pain. And had she a little square of film to wear upon her breast every day of her life, it could only have warned her of one of those dangers. This entry was posted in Shorts and tagged 2011 in books, chemistry, history of science, literature on February 7, 2011 by Meera Lee Sethi. This entry was posted in Longs and tagged change, chemistry, fire, meaning, stray and unscientific on October 29, 2010 by Meera Lee Sethi. At five I couldn’t see the point of hair. I wanted it out of my way, so my mother obliged. 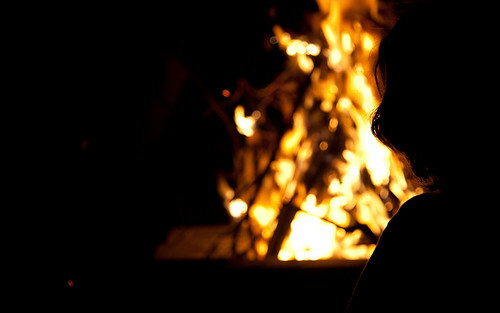 She circled me slowly, shearing it off to just above my chin, and the air filled with a most satisfying ripping sound. Close to my ears the scissors crunched, closing their legs hungrily on my black wings. At eleven I wanted everything under control. I was up when the sun was a murmur, stomach turning at the prospect of breakfast so early. My hair was a thick fountain I had to subdue into a ponytail neat enough for school and my desire to do things exactly right (a desire since mostly lost). I worked and reworked it, each time finding I’d sat my rubber band too far to the left or the right, or that threads of too-short hair were escaping from its noose, or that where I thought I had brushed my scalp into perfect smoothness there was still a small hillock of hair, invisible but to my own questing fingers. My sandwich sat uneaten. I began to imagine it would one day grow so long it would descend into the ground like roots, fixing me where I was. Perhaps that’s why it all came off in one dramatic gesture. How many other things were tangled in it! I looked down when it was done and saw them all snipped in half. Slick heat and sweat. The idea of being beautiful. The memory of dancing to “Copa Cabana” some school-day afternoon, laughing through my fingers. Some of them I’d have wanted to keep, if I’d known that’s where they’d been. The year I turned 21 I was living in Jerusalem with an English boy, and it had been two years or more since I’d sat in a revolving chair, leaning my head back for a cut like a patient ready for surgery. I was very happy then. As for my hair, it was happy, too. It wriggled with happiness; I could feel it sometimes when we sat on the bus together and everyone else leaned a little towards the speakers, listening to the hourly news. My hair leaned towards the English boy. It waved down my back like the shining tide of a gentle sea. At night we arranged ourselves, he and I, like two bookends tucked into each other. That was so he could brush my hair a hundred times, giving it all the attention of a tailor smoothing out a magnificent piece of fabric that had not yet received its first cut. When we parted the boy took some with him; for all I know he has it still. Lately I have been cutting my own hair, chopping at it like a woodman who doesn’t care how rough are the edges of the stumps he leaves behind. I am all business. What is gone is gone. Natalie Angier (I do adore her; she inspired my only fan letter to the New York Times to date) has written that the skin is the organ with the biggest mouth. She says it trumpets our emotions with its goosebumps and blushes, reveals our weaknesses with its scars and scrapes, and is, no matter how much we may wish it to be otherwise, the well-judged cover for a book no one, really, will ever read from first to last page. She’s right, of course: skin is a loudmouth. But if you ask me, what hair lacks in volume it makes up for in storytelling style. It may be bloodless—at least by the time its questing fibers are pushed up from beneath the scalp—but it has a heartbeat. How else to explain the fact that it can keep time (let’s see skin do that)? Don’t believe me? Try this. Take a few long strands of hair from a brand new mother, all relief and tears, her sweet infant barely out of its packaging. Get them right from the scalp, and don’t worry; she’ll barely notice you. Take more from a woman whose child is now three-months known, her eyes bleary from 90 interrupted nights. Another from a six-month mother, practically a veteran of cradling and lullabies and midnight messes, and still more from the head of one just beginning to hear her nine-month-old babble like a brook. All set? Right. Now. Check the very highest tip of the hair from the newest mother, the flickery spot where it emerged from its follicle, for cortisol. That’s a substance that’s a marker for stress (people call it the fight-or-flight hormone). When a woman becomes pregnant she is flooded with cortisol. It soothes her response to pain, gives her more energy, and—some evidence suggests—makes her more attentive to danger. Look at the nib of that hair, and you’ll find cortisol in spades right there, just at the point of her baby’s birth. Now move three centimeters along the hair, and test again. Less cortisol. Another three centimeters, and test again. Still less, in an utterly predictable monotonic progression. Do the same thing with the hair from the other women, and you’ll find the level of cortisol decreasing from high to low, step-wise along the hair, in just the same way—except now the highest level won’t be found at the tip. It’ll be three centimeters along with the mothers of three-month-olds. Six centimeters along with the mothers of six-month-olds. And so on. Line them all up against each other, matching hormone levels as you go, and what you get, in effect, is an astonishingly accurate calendar of pregnancy’s effect on cortisol production in a woman’s body. Here is where it all began, two cells meeting, merging, making plans for the future. Here they’ve grown into a little lemon, here there are hands that wave through amniotic fluid as if swimming. Here everything is ready at last, racing like a freight train towards that long-awaited emergence. All this happens, of course, because a growing hair takes on all manner of free-floating biochemical stowaways in the blood it absorbs from its follicle, each of which is permanently incorporated into its cellular structure at that precise point. If someone were trying to poison you with lead, your hair would know. If you’d been good and given up all your vices, your hair would speak your virtue. And though it has no life of its own, hair still breathes the air you breathe, drinks the water you drink. It remembers where you live. It’s all there—the inner ebb and flow of anxiety and love, the things you’ve brought into yourself, the places you’ve traveled—all documented in a curl. It doesn’t go away, either. Hair can keep a secret for more than a thousand years, it seems. And knowing that, I am a little rueful over the decades of ink I’ve spilled below my chair. Whole novels’ worth, perhaps. The longer the strand, the deeper the communiqué? I’m growing it out now, you know. I’m waiting to see what my blood writes in it. This entry was posted in Longs and tagged chemistry, hair, memory, the body on January 10, 2010 by Meera Lee Sethi.